UniFirst “wet area” mats act as a barrier against slippery surfaces and help reduce stress and fatigue caused by standing on hard surfaces for long periods of time. Our Comfort Plus® “wet area” safety floor mats combine anti-fatigue properties with liquid flow-through features for optimum performance and safety in potentially wet environments. Their cushioned surface also helps protect feet, legs, and backs from the straining effects of standing for long periods of time. The durable surface texture and design of these safety floor mats help prevent slipping and their stud patterned underside promotes drainage and ongoing air circulation. Certified as “high traction” by the National Floor Safety Institute (NFSI), UniFirst Comfort Plus® “wet area” floor mats are oil-, solvent-, and slip-resistant. They're also ADA compliant and designed for placement on all types of flooring. With regularly scheduled floor mat services from UniFirst, all your soiled mats are picked up for professional laundering and replaced with clean, fully functional ones. Learn more about Comfort Plus® wet mats, and other time and money saving floor mat service programs available from UniFirst in our online Facility Service Catalog floor mats collection. We also offer complete UniFirst floor mat rental services for entrance mats, scraper mats, logo mats, and anti-fatigue mats. Start your UniFirst floor mat rental program today. Call (800) 455-7654. 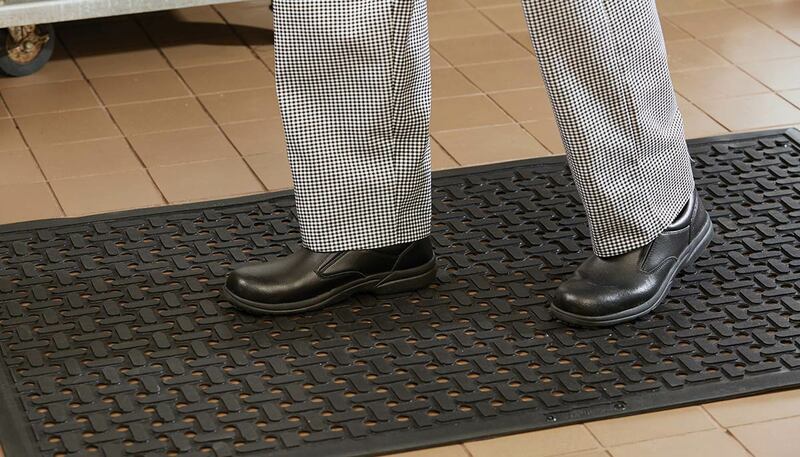 Browse our online catalog and choose from a wide array of floor mats. Conveniently customize a floor mat service program quote for your company.